Fifa has opened an ethics investigation against its president, Sepp Blatter. The action follows a charge by Mohamed Bin Hammam, his rival in next week's presidency election, that Blatter knew about alleged cash payments. Bin Hammam and vice-president Jack Warner will also be at Sunday's hearing to answer charges of bribery. Blatter issued a statement saying: "I cannot comment on the proceedings that have been opened against me. The facts will speak for themselves." The ethics committee are bound by their rules to investigate any complaint by an executive committee member under article 16 of the ethics code. Bin Hammam and Warner face allegations from executive committee member Chuck Blazer that they offered bribes at a meeting of the Caribbean Football Union (CFU) on 10 and 11 May. A file of evidence claims bundles of cash of up to $40,000 were handed over to members of the CFU at the meeting in Trinidad. In turn, Bin Hammam is effectively claiming Blatter was aware of some wrongdoing but did not report it, in itself a breach of the code. The committee, chaired by Namibian judge Petrus Damaseb, will also be investigating two other CFU officials - Debbie Minguell and Jason Sylvester. Bin Hammam issued a statement via his website on Friday concerning the "increasing evidence of a conspiracy against his candidacy" and attempted to clear up the bribery allegations made against him. "After having analysed and answered the accusations of bribery made against Mohamed Bin Hammam, it seems obvious that they are without substance," the statement read. "It is true that Mr Bin Hammam addressed representatives of the CFU at an extraordinary meeting in Port of Spain, Trinidad on May 10 and 11. Nobody has ever tried to hide the fact that Mr Bin Hammam paid for the delegates' travel and accommodation expenses and covered the meeting's administrative costs. "Mr Bin Hammam reiterates that any allegations about him trying to buy votes are completely false. "It is quite obvious that, following previous failed attempts, this is part of a final effort to prevent Mr Bin Hammam from running for the Fifa presidency." The move to place Blatter, one of the most powerful men in football, under investigation is the latest twist in an increasingly bitter fight for the presidency of the sport's global governing body. And it also follows weeks of damaging headlines and allegations in the wake of the vote for the 2018 and 2022 World Cups. BBC sports editor David Bond said: "Fifa is now an organisation completely at war. They cannot possibly continue in this way and many people will say they should suspend the presidential election, which takes place next Wednesday. "Under Fifa's ethics code, they are duty bound, if a member of the executive committee makes a complaint to the ethics committee, to then investigate it. "So, it may be that the allegations against Blatter don't come to much, and the allegations against Bin Hammam and Warner could be far more serious. Ultimately it seems the evidence against Blatter is only Bin Hammam's word against his. "It is very difficult to predict exactly what will happen next, but it's hard to see this as anything other than a watershed moment for Fifa. "It feels like at last the dam is breaking around them. It is a bit like the scene at the end of Reservoir Dogs when everyone has a gun pointed at each other's heads." 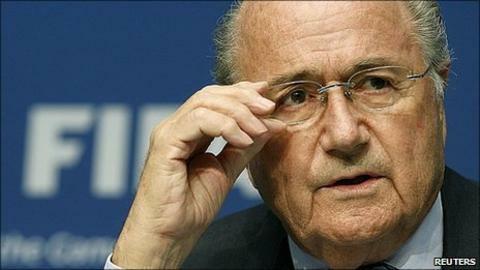 Blatter has been president of Fifa since 1998. Michel Platini, the president of European football's governing body, Uefa, who is tipped to run for the Fifa presidency in four years' time, described the latest development as "a very interesting moment". He said there would only be a postponement of Wednesday's presidential elections if three-quarters of Fifa's general assembly agreed. But sports minister Hugh Robertson was in no doubt that the election should be postponed. "The Fifa presidential election campaign has descended into a farce," he said. "With both of the candidates having allegations of corruption aimed at them the election should be suspended." Platini, whose organisation have thrown their weight behind Blatter's bid for re-election, described himself as "incorruptible". "You know the people who are corrupt, they know who can be corruptible," he said. "They know I am incorruptible." He also argued that corruption was an issue not only in football, but the whole of society. "Football is the most beautiful and popular game in the world and we have to resolve these problems," he said. "[But] it is not only a fight in football. Football is a mirror for the society and what happens in football can arrive in every part of the society." Meanwhile, an FA inquiry into claims by ex-chairman, Lord Triesman, that Warner and three other executive committee members made improper requests during England's 2018 World Cup bid has found evidence of several possible rules breaches. The report, written by barrister James Dingemans QC, has been sent to Fifa and raises "outstanding issues" with Fifa's ethics code and bidding rules. It is understood that only the claims against Warner have been corroborated by witnesses. The claim that Warner asked for financial help to build an education centre has been backed up by Premier League chairman Sir Dave Richards, while Dingemans' file also includes an email from Warner to Triesman asking the FA to pay for Haiti's World Cup TV rights. An FA spokesman said: "Mr Dingemans cannot make a final determination on whether there has been any wrongdoing because he does not have jurisdiction to speak to the Fifa executive committee members. "It is for Fifa to do this and for Fifa to determine whether any of its rules have been breached."